There is an old adage which reads 'lightning never strikes in the same place twice' and although it has been proven to be incorrect, it still held some water this weekend as Clayton's Kola Tonic Notre Dame were denied back-to-back comebacks in the Premier League. Playing in Sunday's nightcap at the Wildey Turf, the Dames might have been looking for the same magic from the week before that saw them coming from 3-0 down against Paradise. However, there would be no such luck as they crumbled under the march of the Barbados Defence Force Sports Programme. With the Dames coming back in the second half to beat out the Dover boys 4-3 last week, many were wondering if they had goods to pull off a similar feat when Zeco Edmee got them on the cards with a goal in the 39th minute. However, by then, the Sports Programme had already racked up three from T'Shane Lorde (2nd), Rashad Smith (11th) and Omani Leacock (18th). There was no comeback for the Dames this time around and the soldiers extended their lead to come away with a 6-1 win. Rasheed Williams put the ball over the line in the 51st while Leacock was good for two more to pick up a hat-trick. His second goal came from a penalty in the 65th and he finished things up in the 74th. In the earlier game, Paradise snuck three points away from the University of the West Indies Blackbirds with a 2-1 win. After Sheran Hoyte gave Paradise the edge in the 46th minute, Akeene Browne had spark of individual brilliance in the 77th minute. Getting the ball from a long switch from Kadeem Ellis on the left flank, Browne was given some room and he moved through the traffic of four defenders before slotting to Jason Boxill's right to tie things up. A defensive blunder at the 11th hour saw Paradise regaining the lead and taking the game. 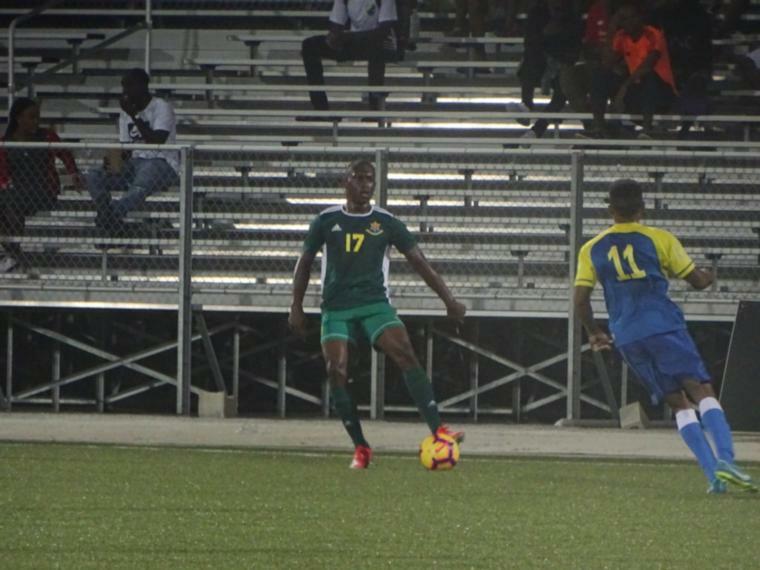 With the ball in UWI's defensive third, a pass-back to young goalkeeper Shaquan Phillips saw the national Under-17 custodian pushing the ball a bit too far from his body. Dario Harewood smelled the opportunity and advanced as Phillips hurriedly rushed to clear. All Harewood needed to do was stick a boot out and the rebound saw the ball rolling into the nets as the two collided harmlessly and fell. The first game on the day saw Scotty's Car Rentals St. Andrew Lions coming away with a 1-0 win over RBC Capital Markets Barbados Soccer Academy. Shamar Edwards picked up his ninth goal of the season when he put the ball past the BSA keeper in the 10th minute of their encounter. On Saturday, Crane and Equipment Ellerton eased to a comfortable 5-1 win over Mark's Auto Spares Porey Spring in the first game of the night. Goals came from Shakille Bell (7th), Anson Barrow (9th), Shaquon Clarke (12th), Romario Drakes (24th) and Shad Parris (48th), while Porey Spring got their consolation from Lindell Sandiford in the 16th. Empire Club picked up the other points on the night as pulled out a 3-1 victory in their game against Brittons Hill United. A brace from Curtis Odle after strikes in the 4th and 50th, and a single one from Jabarry Chandler in the 29th, saw Empire sitting pretty in the second half. Brittons Hill would pull just one back in the 61st through the efforts of Romario Coppin.